Following on from successful presentations in both Kent and Surrey, today saw me presenting again – this time in Essex. 100% rated the presenters as Good/Excellent. The workshop is a guide on how people can benefit from using the popular Social Media platforms such as Facebook, Twitter, LinkedIn etc and also now BNI Connect. We also take attendees through all they can do with BNI Connect and how to have a great online presence, both locally, nationally and worldwide. Together we give attendees the ‘Know How’ to use Social Media to help them in their business and also the BNI angle to help their referral marketing and growth for themselves and their local group. 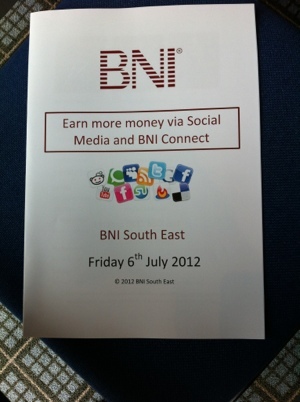 There have been many requests for BNI Connect Training and Social media, so the workshops will be coming back to Kent, Surrey and Essex later in the year.